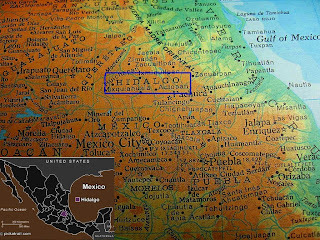 Inexplicata-The Journal of Hispanic Ufology: Mexico: What Crashed in Hidalgo? INEXPLICATA recieved a message yesterday morning from Contributing Editor Ana Luisa Cid regading the collision of an unexplained object in the state of Hidalgo (central Mexico) -- initial excitement over an "extraterrestrial" event was replaced with more conservative comments about "Soviet-era space junk", "meteorites" and even "an explosion in a local mine"
News items received today read thus: "Meteorite allegedly left a hole 30 meters in diameter and caused houses and buildings to shake in five municipalities of Hidalgo and Puebla. At 18:30 hours on Wednesday, [February 10, 2010] a light accompanied by a powerful rport caused homes and buildings to shake throughout five municipalities in [the states of] Puebla and Hidalgo. The event was attributed to a meteorite impact. The thunderous impact was heard in Ahuazotepec and Huachinango, communities in Puebla, as well as in Tulancingo, Cuautepec and Metepec, in the state of Hidalgo. According to latest reports, the meteorite caused a bridge to collapse in the municipality of Cuautepec (Hidalgo) without any material or human losses reported. State Civil protection reported that emergency phone lines collapsed due to the number of frightened citizens asking for an explanation about what was going on, after the detonation caused windows to shatter. The agency's director, Miguel Garcia Conde, said that flight logs were checked at airports when the report was received, out of concern for an airplane crash, however "there was no report regarding a loss of communication with any airliner." Military units cordoned off the area where the 30-meter hole was found - produced by the meteor impact - as oil pipelines belonging to PEMEX cross the area. Of course, only minutes after posting this news item to the site, a message rejecting the "meteorite" theory was received - and rejecting the affirmations that a 30-meter hole was proof of the impact. MÉXICO (UNIV) -- Scientists consider that it was either a bolide or the remains of a satellite. To many, it was a smokescreen employed by the government to levy new taxes, or even a crashed UFO that is now in the hands of NASA. Ufologist Jaime Maussán took it all very seriously and sent a reporter to the area to commence "an investigation" to be presented on his Sunday "Tercer Milenio" program. The stories agree that the "fireball" allegedly witnessed by residents of municipalities in Hidalgo and Puebla had a cosmic origin. However, it was impossible to record it or photograph it. The bolide crossed the atmosphere in fractions of a second. A loud sound was heard first, followed by a reddish light. Thousandths of seconds later, no one knew what became of it. When advised of these reports, Daniel Flores, a researcher for the UNAM Astronomical Institute and an expert in space debris and meteoritics, said that the so-called "fireball" has all the traits of a bolide, that is to say, a mass of cosmic matter than, as it moves between the planets, eventually crosses the atmosphere in a matter of seconds without reaching the ground, unlike meterorites that do crash. News of the fireball sighting, followed by an explosion recorded on Wednesday afternoon in Tulancingo del Valle, Hidalgo, y Ahuazatepec, Puebla caused elements of the fire departments and Civil Protection agencies to mobilize. The rumor caused Miguel Garcia Conde, Director of Civil Protection in Hidalgo, to complain about having spent 24 sleepless hours over what he qualified as a "very serious error by the media" since the object was dubbed a meteorite. The so-called "fireball" gave rise to all manner of speculation on the Internet. 24 hours after residents saw the bolide, the news item already had 140,000 links on the Google search engine. Speculation was rife: that it had left a crater 30 meters in diameter and that the army was unable to find the enormous hole produced. Others concluded that it was a rumor similar to that of the "Chupacabras"